The 9924SP is one of the most advanced Gigabit Ethernet switches available. As with all members of the 9900 series it provides fine service provisioning granularity, high availability, advanced QoS and shares the same modular power supplies used in the other 9900 series switches. The 9924SP is an ideal choice for networks that need high availability and SFP interface flexibility. 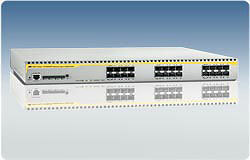 The 9924SP also offers an extensive set of management features and offers advanced multicast routing options. Dual hot-swappable power supplies are supported and front-to-back airflow optimizes switch cooling.